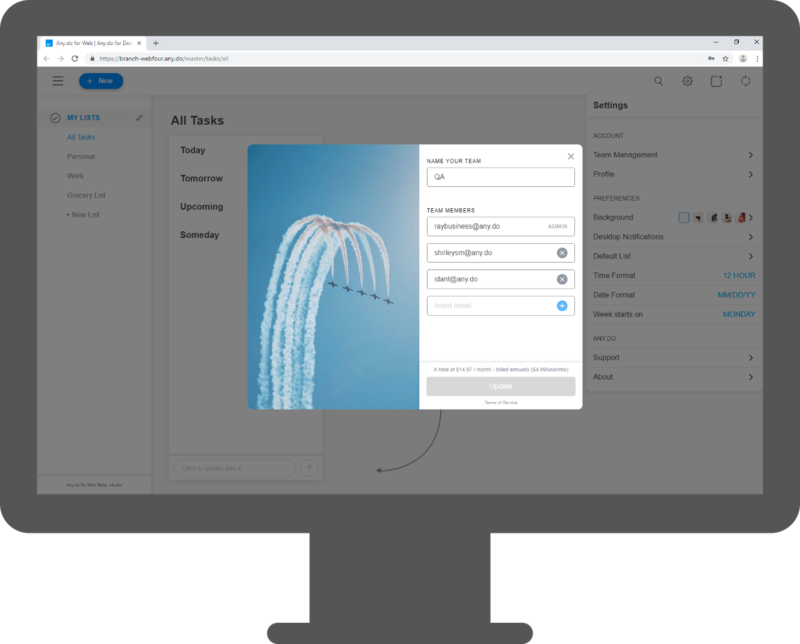 Any.do for Teams is a great way to accomplish tasks by sharing tasks and lists, uploading files, managing your team and more. Through the Any.do for Teams platform, you can purchase as many Premium subscriptions as you would like and assign Premium status to the emails of your choice. The Premium accounts for all users are the same as regular Premium accounts, but with Any.do for Business, there is a team management page where you can add or remove members, assigning them Premium status. We know that nobody wants to jump in without testing the water first, which is why we offer a two week free trial of Any.do for Business. During this trial, you can get to know the feature and see how well it works for your team without getting charged. If you wish to cancel the trial, you are free to do so at any time. If you are already a premium member, just follow instructions to cancel your subscription here and come back to subscribe to a business account. Once you create a Team for the Any.do business plan, you can continuously update your team name, members, and number of members. Please note that if you add a team member you will be billed relative to the remaining days time of the payment period. When you remove a team member in the middle of the payment period, you will be refunded proportionately to the time left in the payment period. In the next payment period, you will be billed for the amount of team members that are on your team. The Team Settings are currently available on Web only. However, any changes there will reflect to your mobile apps as well. Teams users on mobile apps will see their status as ‘Premium.